Cheshire Oaks is a bargain hunter’s dream. Situated on the outskirts of Ellesmere Port it boasts more than 130 shops, most selling clothes and fashion accessories (top designers labels and high street stores are here). Products stocked are usually last season’s fashions. They are offered with discounts of up to 70 per cent off the original store prices. Cheshire Oaks opened in 1995 and was the first designer outlet village in the UK. Over seven million shoppers now visit the centre each year. Facilities and services include a visitor information centre, children’s play areas, free wireless internet access, wheelchair hire, toilets, and baby changing areas. Cheshire Oaks is open seven days a week. Standard opening times are Monday to Friday 10 am to 8 pm, Saturday 9 am to 8 pm, and Sunday 10 am to 6 pm (large stores 11 am to 5 pm). For opening hours at Christmas and other holidays check the official Cheshire Oaks website (see information box below). Cheshire Oaks is situated just off Junction 10 of the M53 and is clearly signposted. Visitors with satellite navigation systems should note that the postcode for Cheshire Oaks is CH65 9JJ. The centre boasts both surface and multi-storey car parks. Over 3,000 car parking spaces are available Parking is free for customers. 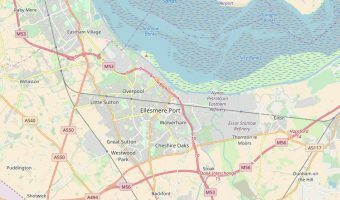 The closest train station to Cheshire Oaks is Ellesmere Port. The Coliseum Shopping Park is immediately west of Cheshire Oaks and offers more shops and eating and drinking options. The Coliseum Leisure Park is also nearby and is home to the Vue Cinema Cheshire Oaks, Tenpin Cheshire Oaks, Paradise Island Adventure Golf, the Travelodge Cheshire Oaks, and a good choice of restaurants. The Blue Planet Aquarium lies just south of Cheshire Oaks. Map showing location of Cheshire Oaks. I visit the cafes and shops every day. The customer service is great. However Pret A Manger should open at 8.30 am but often sends me and other customers away due to being behind their schedule. Some customers are wanting breakfast before work. If they haven’t enough staff then they should state clearly 9 am. People who turn have made an effort to have breakfast there. Sorry but it’s annoying. Build-A-Bear Workshop and Paul Smith opening at Cheshire Oaks in November. Hotel Chocolat opening at Cheshire Oaks on Friday 21st October 2016. Its certainly worth the trip. We travel there at least 5 times a year from Birmingham. Motorway is pretty good and the fact that parking is free is a bonus. Kids play corner is also an added bonus. A range of shops and loads of stress free bargains all in one location. Its worth the trip.. It is a good place to shop with some good bargains if you look around. It gets quite busy at weekends and parking can be a little tricky (but it is free). The highlight is the new Debenhams store. This is a good place to shop with all the best stores in one place. Getting there was easy with good access from the M53. The prices were discounted quite a bit but I wouldn’t call them cheap bargains. I will certainly visit again. Retail park in Ellesmere Port.